Seolfar an chéad cnuasach filíochta le Pauline Mhic Chonaonaigh, Tadhall(Cló Iar-Chonnachta) ina bhfuil grianghrafanna le Simon Boyle, ag tráthnóna speisialta filíochta agus ceoil. Is í Máire Ní Neachtain a bheas ina bean an tí, agus beidh dánta á n-aithris ag Deirdre Nic Chonaonaigh, Síle Nic Chonaonaigh agus Maidhc P. Ó Conaola, le ceol sainiúil ó Johnny Óg Connolly. Fáilte romh chách. Join us for a special evening of new poetry and Irish music when the debut collection by Pauline Mhic Chonaonaigh, Tadhall(Cló Iar-Chonnachta) will be officially launched. The book includes photographs by Simon Boyle. 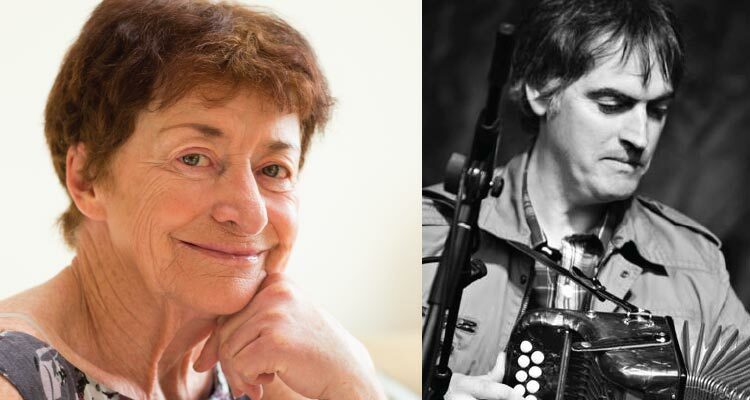 The evening will be presented by Máire Ní Neachtain with readings by Síle Nic Chonaonaigh, Deirdre Nic Chonaonaigh and Maidhc P. Ó Conaola, accompanied by the distinctive music of Johnny Óg Connolly. All welcome. Is le blianta beaga anuas a thosaigh Pauline Nic Chonaonaighag scríobh, a hionsparáid ag teacht ó na míorúiltí beaga a fheiceann sí sa domhan timpeall uirthi: fáinleoga ar a dturas, solas na gealaí i gcomhrac leis na néalta, nó an chodarsnacht sin idir duairceas an dorchadais agus ardú meanma is éadroime an tsolais, idir oll-chiúnas an dúlra agus réabadh fíochmhaire na stoirme. Pauline Nic Chonaonaighbegan writing in recent years, her inspiration coming from the small miracles she sees in the world around her: swallows on their journey, the light of the moon piercing clouds or the contrast between the palpable intensity of stillness and the ripping ferocity of a storm. Le tacaíocht ó Ealaín na Gaeltachta Teo: Comhpháirtíocht idir Údarás na Gaeltachta agus An Chomhairle Ealaíon – Ag forbairt na nEalaíon dúchasacha agus comhaimseartha sa Ghaeltacht.